Fr. Mark Monaghan SMA, Vicar General, representing the Archbishop of Kaduna, Most Rev Matthew Man’oso Ndagoso was the Principal Celebrant at the first Mass to be celebrated in St Rita’s Church, Malali, Kaduna since the bomb attack on Sunday, 28 October. Our picture shows Fr Mark with the Parish Priest, Fr Mike Bazza OSA after the Mass. The bomb exploded when the congregation was exchanging the Sign of Peace. Four parishioners were killed and hundreds injured. 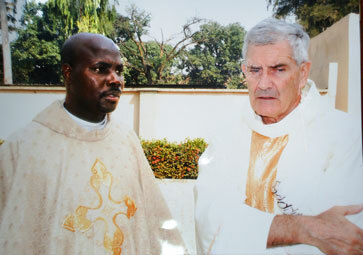 Fr Bazza was among those hospitalised. He was released in time for this celebration of Mass, which was celebrated exactly one week after the attack, and which was attended by over 2,000 people.